Ocean Garden Villas condo rentals in North Myrtle Beach, South Carolina will provide your family a beautiful two-bedroom North Myrtle Beach condo for your family’s beach vacation. At Ocean Garden Villas you and your family will find everything you need to be most comfortable when you stay at one of these oceanfront condominiums in North Myrtle Beach, South Carolina. At 1809 South Ocean Boulevard in North Myrtle Beach, South Carolina you will find Ocean Garden Villas. 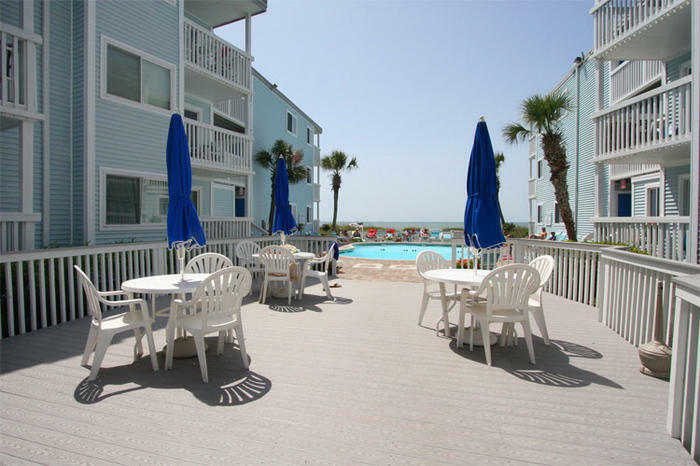 Ocean Garden Villas is in the Crescent Beach area of North Myrtle Beach, South Carolina. These North Myrtle Beach condo rentals are located on the oceanfront, only a few short steps from the beautiful Atlantic Ocean in North Myrtle Beach, South Carolina. The Crescent Beach area of North Myrtle Beach is located on a family beach close to Highway 17 and close to unlimited family fun. You can access your two-bedroom, two-bathroom North Myrtle Beach condo in Ocean Garden Villas very easily. Find a parking spot close to the entrance of Ocean Garden Villas. There are two parking lots with enough spaces for everyone. Then just walk right into your first-floor, two-bedroom North Myrtle Beach condo or take the stairs up one or two short flights to the second or third floor where you will find a your peaceful, oceanfront, two-bedroom North Myrtle Beach condo for your family to enjoy during your North Myrtle Beach vacation. Bring up to nine of your family members and friends with you to North Myrtle Beach, South Carolina and stay at Ocean Garden Villas. There is enough room in these two-bedroom, two-bathroom North Myrtle Beach rentals for everyone to feel comfortable. These North Myrtle Beach condo rentals have multiple television sets and DVD players. Some of these condos in North Myrtle Beach have wireless Internet for everyone’s convenience. Enjoy cooking a meal for your family in the fully furnished kitchens in Ocean Garden Villas in North Myrtle Beach, South Carolina. These kitchens come with everything you are used to having at home and all that you need for a night in with the family. You can also enjoy the beautiful South Carolina sunshine when you take advantage of one of the two grilling areas located just outside of the sparkling blue swimming pool and a few feet before the ocean. Elliott Beach Rentals is not affiliated with onsite management or the HOA of Ocean Garden Villas.